Checks are considered funds in transit. That means you can accurately record them as deposits, but the amount won't appear on your bank statement till later. Accurate tracking of these funds is key to knowing exactly where your liquid assets stand. Go to Accounting > Transactions in the left-hand navigation menu. If you're recording a check you wrote, click Add Expense. If you're recording a check you received, click Add Income. Enter the date and description of the check. Including the check number in the description is a helpful way to differentiate check transactions from other transactions. When you've recorded the checks, it's time to wait for them to clear the bank. A cleared check, sometimes called a processed check, is a check that you are able to see on your bank statement. To track the check amounts, categorize and verify all non-check transactions. The only unverified transactions should be outstanding checks. When all you have left is unverified checks, turn off all transaction filters. Filter by the bank account of your outstanding checks. Once this filter is on, the Difference amount is dollar amount of outstanding checks. In the example below, there is income of $134.89 outstanding and an expense of $95.00. The difference, $39.89, is what the bank account is short because of outstanding checks. Once the check appears on your online bank statement, it's time to clear it in Wave. If you have your bank account connected, once your check transaction is imported, merge the two transactions together. 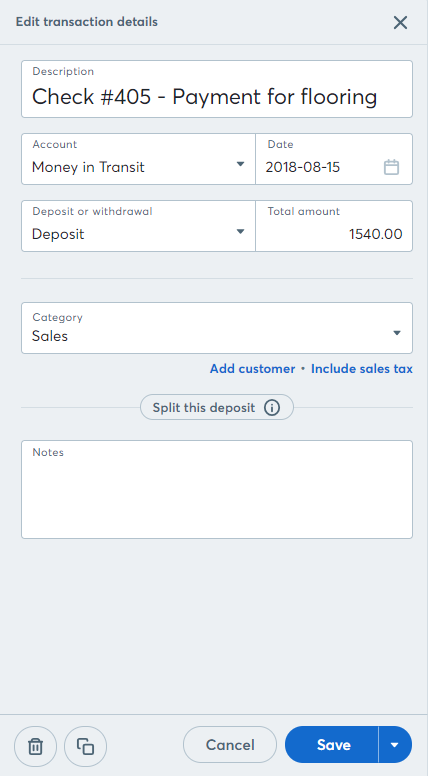 To do this, select the checkbox beside your bank transaction and manually entered check, then click merge at the top of the Transactions page. Once the transactions are merged, verify the check. If you manually enter transactions, once your check transaction is present on your online bank statement, verify the outstanding check. Create a new Money in Transit account to help bookkeep your checks appropriately. Go to Accounting > Chart of Accounts in the left-hand navigation menu. Here, create a new account under Assets > Money in Transit. Make sure to name the account something that makes sense for your business (for example, Checks in transit, Checks undeposited, or Money in Transit). Once saved, you should see this new account under the Assets tab > Money in Transit heading. Head over to Accounting > Transactions in the left-hand navigation menu. Click Add Income or Add Expense in the top right. If you're recording a check you wrote, select Add Expense and label as a Withdrawal. If you're recording a check you received, click Add Income and label as Deposit. Enter the date and description of the check. 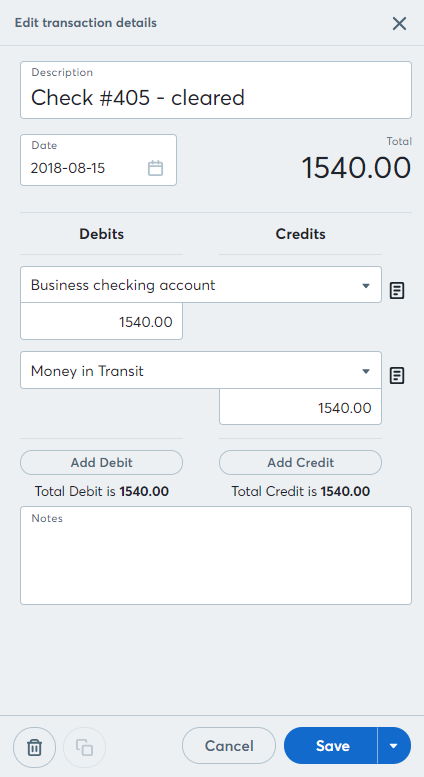 Including the check number in the description is a helpful way to differentiate check transactions from other transactions. Under Account, select the Money in Transit account you created in Step 1. Then categorize your transaction into the appropriate income (if this is a check received) or expense (if this was a check sent) category. Now that you've entered your checks, it's time to wait for them to clear the bank. A cleared check, sometimes called a processed check, is a check that you are able to see on your bank statement. Once the check appears on your online bank statement, it's time to clear it in Wave. What you need to show is the movement of these funds from Money in Transit to your Bank Account, so you'll record a journal entry. Click the arrow next to the Add Transaction button, then select Add Journal Transaction. If you received the check, Credit the Money in Transit and Debit the Bank Account where the check cleared. 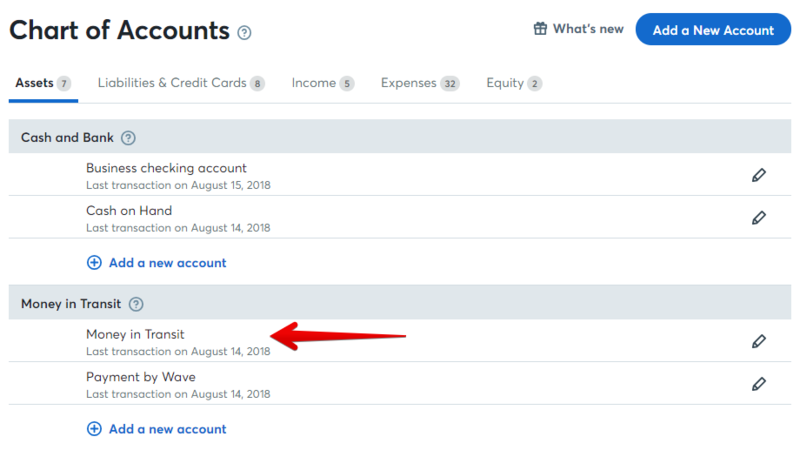 If you sent the check and saw the money pulled from your bank account, Debit the Money in Transit and Credit the bank account where the withdrawal occurred. That's it! You've entered a check, tracked it, and cleared it when the funds appeared in your bank. With this workflow, you will be able to track any outstanding checks, have an accurate representation of exactly what is available in your bank accounts, and have better visibility into your cash flow.